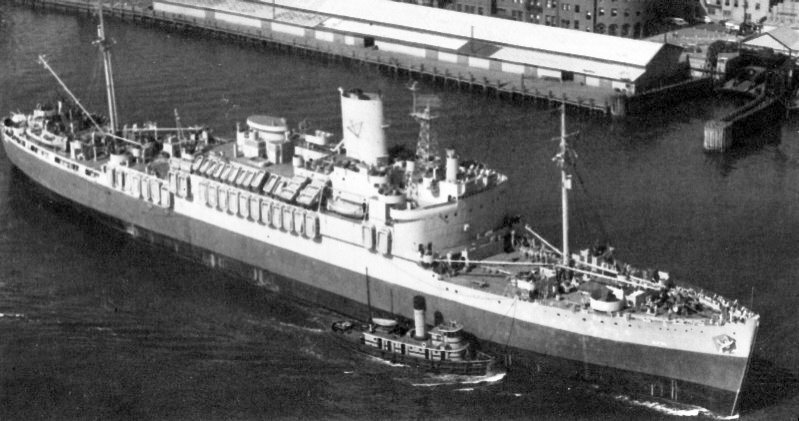 USS Lejeune (AP-74] was a German cargo liner that was converted to a US Navy troop transport during the Second World War. Her original name was TS (Turbine Ship) Windhuk. Windhuk was built at the Blohm & Voss shipyard in Hamburg, Germany and completed in 1936. 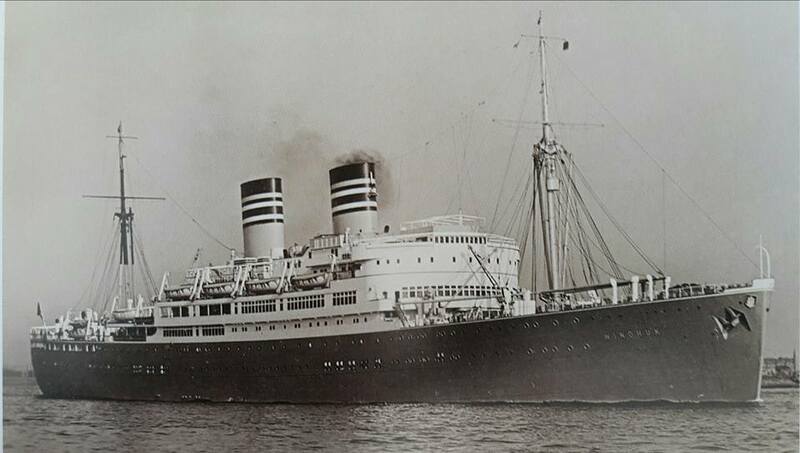 She was one of a pair of sister ships completed that year for Deutsche Ost-Afrika Linie: the other being TS Pretoria. After the outbreak of the Second World War in September 1939, Windhuk evaded the Royal Navy for two months and then took refuge in harbour at Santos, São Paulo, Brazil on 7 December 1939. Windhuk was still in Santos on 22 August 1942 when Brazil broke ties with Germany and interned the ship. When her crew learned that she was to be interned, they sabotaged most of her machinery. They poured concrete into the main turbine engines. They drained the boilers of water and then lit the furnaces, which melted the boilers beyond repair. They cut her main shafts and bearings with high temperature metal cutting torches. They damaged all electric generators, refrigeration equipment, steering gear, small motors, etc. beyond repair. However, they made no attempt to scuttle the ship. Windhuk remained in Santos until January 1943 when she was towed to Rio de Janeiro for repairs. In 1942 the US Government bought Windhuk from Brazil and sent two hundred US Navy personnel to Brazil to fit her with a new diesel engine. The work was not completed until March 1943, when she made a thirty-day voyage to Norfolk, Virginia for further work and conversion to a troopship. When she arrived in Norfolk, she had been stripped of most of her elegant furnishings such as mahogany and teak wood paneling. She was refitted as a troop transport, which took about a year to rectify all the sabotage by the German crew. While at Norfolk she was named USS Lejeune (AP-74), after USMC General John Archer Lejeune. Lejeune was fully commissioned in April or May 1944. On 11 June 1944, she began her wartime service in her new role as a US Navy troop transport with a voyage from Norfolk to Glasgow, Scotland with 4,460 soldiers aboard. Her troop capacity would later be increased to 4,650. Beginning on 12 July, she then made a trip from New York to Glasgow, with 207 officers and 4,307 Navy personnel. In December, she made an Atlantic crossing with elements of the 69th Infantry Division, which was destined to meet Soviet troops on the banks of the Elbe River deep within Germany five months later, in April 1945. Lejeune made a total of ten round-trip transatlantic crossings before the end of the war, and a further nine crossings were made to the United Kingdom, France or Africa in the months immediately after, until she returned to Norfolk 9 May 1946 for overhaul. On 28 September 1946 Lejeune resumed service. From 19 October 1946 to 1 August 1947, she made a total of four trips to the Pacific, from San Francisco to Shanghai and Tsingtao, China, and to Yokosuka, Japan. She then sailed back to New York City, reaching her destination 29 August, and from there returned to San Francisco 25 September. USS Lejeune departed San Francisco for Bremerton, Washington on 2 October 1947, where she was decommissioned 9 February 1948 and placed in the Pacific Reserve Fleet at Tacoma, Washington. She was struck from the Naval Vessel Register in July 1957 and scrapped at Portland, Oregon 16 August 1966. Her ship's bell however was preserved, and in 1971 it was mounted on the flagstaff at Marine Base HQ Camp Lejeune. During her US Navy career Lejeune transported more than 100,000 troops. It happened in the Carnival of 1942, a few days after Oswaldo Aranha declared the diplomatic ties between Brazil and the Axis countries (Germany, Italy and Japan), were broken at the end of the Convention of Chancellors in Rio de Janeiro on January 28. Political alignment with the Allies, derived from this statement, had been stamped on several newspaper headlines in Brazil, in the same way that the news was being heard on the radio all the time. Thus, it was more than publicized the fact that would determine the life of so many foreigners of the Axis in Brazil. The crew of the German ship Windhuk (which had been in Brazil in 1939 and has not been on the voyage ever since, due to the outbreak of World War II) were lodged in Santos and continued working on the ship between 1939 and 1942. Upon hearing the declaration of disruption, That their lives would henceforth be affected again by war, and now, definitely, in comparison to the changes and setbacks they suffered with the beginning of the conflict in 1939 and the impossibility of returning to Germany. Before they were totally forbidden from revisiting the Motherland, twelve sailors from Windhuk decided to flee Brazil. In February 1942, they planned the escape, in Santos, by means of a whaler, which was named Santa Fe. It was an old fishing boat, 12 meters long, reinforced to support the high seas. The intended route was to cross the Atlantic to Dakar, Africa, and from there to Europe. Santa Fe and its twelve crew set sail from Praia das Vacas in São Vicente on the Carnival Sunday of 1942, under the command of Captain Wilhelm Doblinger. On the second night of the voyage, on the open sea, the sailors endured a storm that sent Captain Doblinger overboard and disappeared into the sea. The ill-fated escape resulted in the death of one of his companions. Another sailor took command of Santa Fe and the course of the trip was redirected to Cabo Frio in Rio de Janeiro. Again, the forces of maritime nature threatened the fates of these sailors, for they entered a stream which caused the ship's engine to collapse. So, they need to return to the beaches of Brazil. 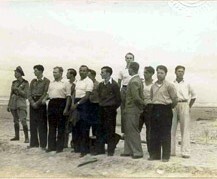 The eleven survivors seen at the beach following their capture. Notice one Police officer at far left. 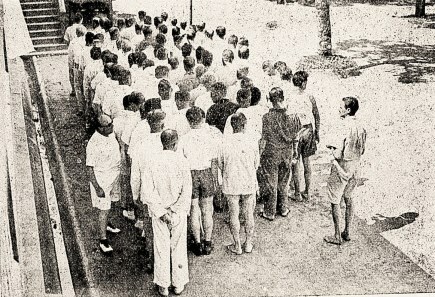 Prisoners from Windhuk are seen gathered at the prison repository waiting for meal. During internment in Brazil, the crew was interned (in stables converted into internment camps) in small towns far inland. They were used as a workforce, and during times off were able to play soccer and perform musical presentations. 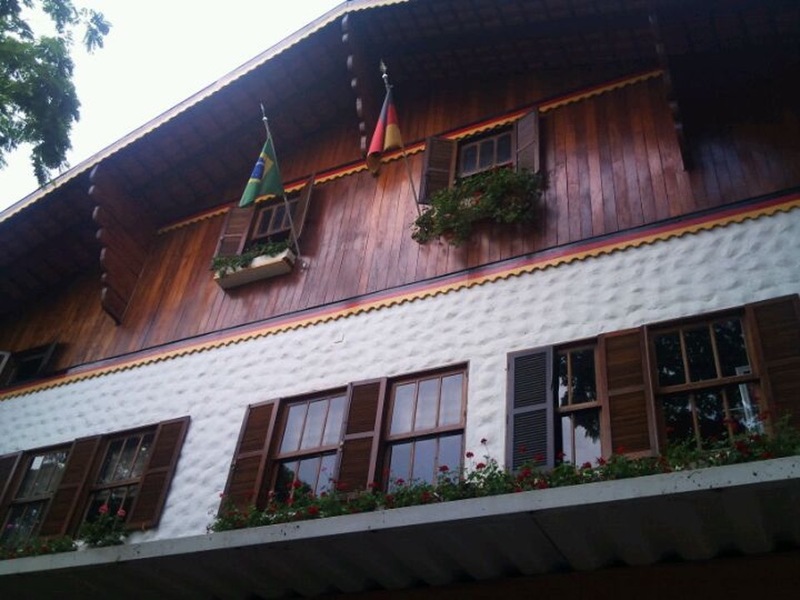 Many married Brazilian women and decided to stay in Brazil, which has had a significant German minority since early in the 19th century. After the war, some of the remaining crewmembers, especially older ones, returned to Germany. One group of former crew who stayed in Brazil after the war opened a restaurant in São Paulo named after the ship, serving dishes from her former passenger menus. Below, the typical German façade of Windhuk Restaurant.